Yeah so it ended up a greeny brown BUT it did taste good and my bowels will thank me for devouring two bowlfuls for my lunch today! 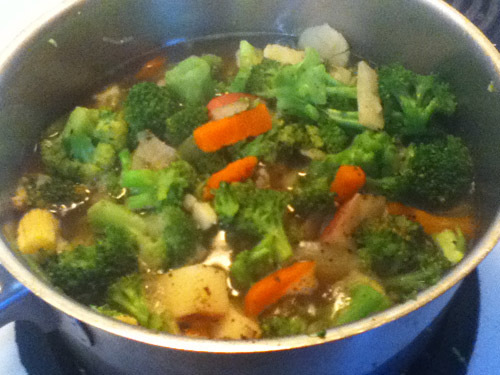 I had a big bunch of broccoli to use up and I HATE wasting food. 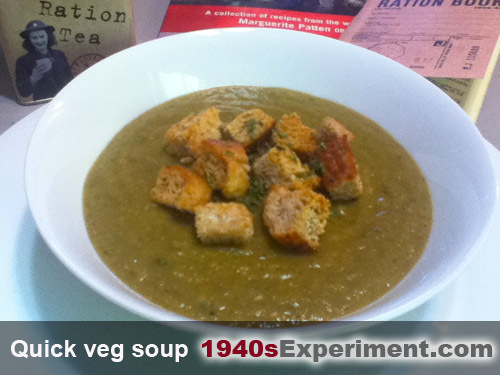 In good wartime tradition I chopped that up and used it with some other mixed vegetables to create quite a tasty thick soup, enough to serve 4-6 topped with delicious homemade croutons. While cooking vegetables for so long diminishes their nutritional value and enzymes (always make sure to eat some raw fruit and vegetables and wholefoods everyday! ), it’s still better to eat a lunch like this than grabbing a burger from a fast food restaurant and I know you’ll think I’m talking out of my rather large posterior BUT a raw salad or a veggie soup wins hands down for me every single time… HONEST!!! 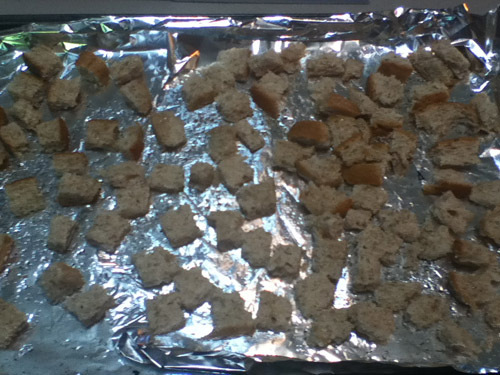 Don’t ask me why, but I’ve NEVER made croutons. 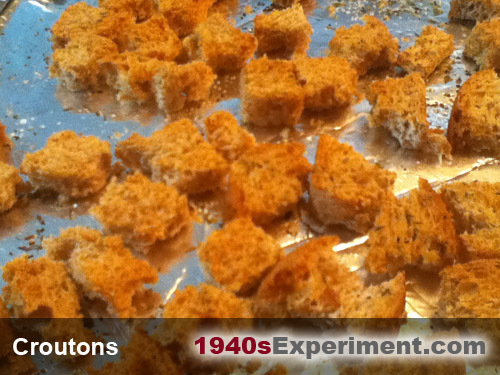 Somehow I thought they would be finicky, difficult, mushroom-cloud-exploding-from-the-top-of-my-head-annoying even… So when I saw a recipe for homemade croutons in a wartime recipe book of mine, and it looked so simple I didn’t feel my blood pressure spiking, even for one moment, I HAD to give it a go. 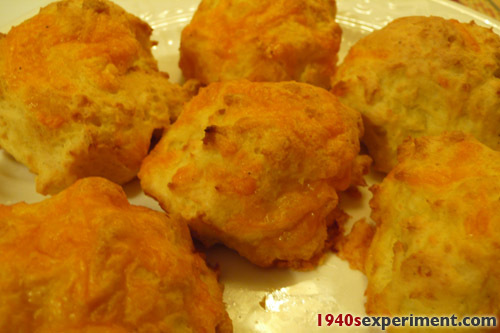 This recipe was SO DAMN SIMPLE! Although I haven’t had pre-packaged shop bought croutons for a long, long time, I’ve never been a big fan. They seemed too oily, too garlicky and too damn hard. These homemade croutons were light and crispy and tasty and PERFECT on top of the “Quick Vegetable Soup” I made this morning. I’ll never, ever go back to buying croutons again…there seriously is no point. I prefer my croutons without garlic but you can easily rub a sliced clove over the tray before adding the bread or indeed bake a couple of cloves with the bread. Add your own seasoning and herbs to taste..
My mind has been focusing on a number of things including participation in the Relay for Life event here in Canada. I’ve been raising funds for the Canadian Cancer Society and will be joining my team mates and hundreds of other walkers on June 1st, to walk in a relay throughout the night to honour, remember, raise awareness and celebrate the courage of those who have fought and are fighting against cancer. Am sure to be humbled by the participants.. So I just wanted to thank you for your donations- every single dollar has helped and will help and I appreciate your support. I now have 7 days left to get used to walking lots more than I am used to, I know it’s going to be hard but am just so very grateful, having lost weight, that I can now participate in this event. Things are slowing down but if I’m honest, I have been exercising less. 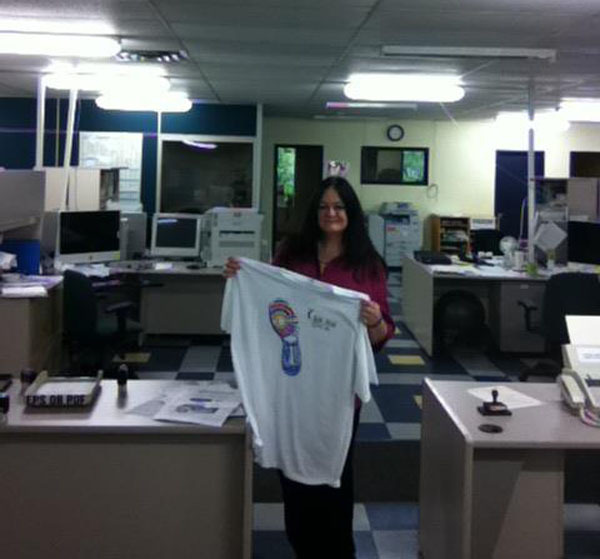 In two weeks time I take part in a big countrywide event here in Canada… “Relay for Life”. It is an event to honour and remember those who are fighting cancer and also to raise money to further cancer research. On June 1st a small team of work colleagues and I will walk, in a relay, throughout the night. It means a lot to me to be able to participate in this, having now lost 64 lbs, since Oct 1st, I can! So although today I feel a little discouraged at the weight gain I am excited about the opportunities losing weight is giving me. 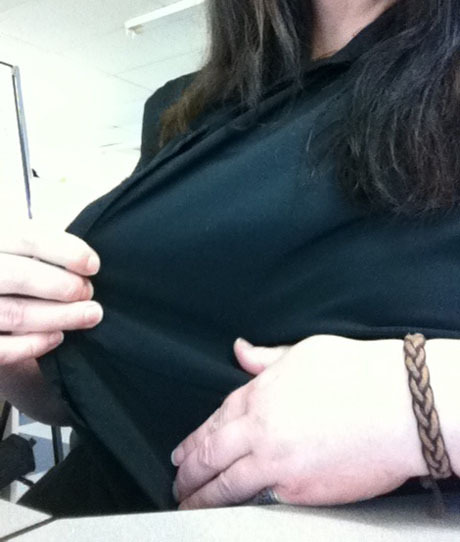 And today I am wearing my black shirt, the one I had my 255 lb photo taken in, and it is HANGING off me. I can remember how not so long ago I couldn’t wear it as it was tight and stretched! Tomorrow I start training hard for “Relay for Life” and I am sure the scales will reflect this. I really don’t like to talk about the political aspects of veganism. Certainly not in a manner anyway that pushes my personal beliefs down anyones throats and attacks others for having different opinions from my own (I am referencing zealotry and extremism an example) so I got quite upset from a comment left by Richard, a member of the Vegan Society, on my blog recently. I wasn’t upset by his strong principles, but upset by his verbal prejudice and venomous rhetoric to another human being especially without taking the time to check his facts. Most of us on our planet are peaceful individuals, we tolerate each others differences and quietly work busily behind the scenes or in a productive enthusiastic way to make changes to the wrongs we want to see righted. I’ve forwarded a link to the Vegan Society for comment and also to remind them of my prior request for further information on veganism in the 1940s (The Vegan Society was founded during the wartime 1940s and they produced a newsletter). Please take a moment to read the comment left on my blog below and add your thoughts (nicely) please..
My lovely friend Naomi posted this on my personal Facebook wall this morning…. I love motivational videos and photos and unashamedly use them most days to keep my own focus on the straight and narrow.